While I like a Bond film or a Die Hard 4.0 I prefer my spy films to be a little more believable, a bit more visceral more like Ronin or Iprcress Files. The first two Bourne films fell squarely in that camp. I saw The Bourne Ultimatum and it doesn’t wander from the path. Like the first two it’s a cat and mouse story with Jason Bourne (Matt Damon) sometimes the cat and sometimes the mouse. It has the action sequences and the stunts to keep things moving. The characters have often missing from action films that means you care. Even about the bad guys. 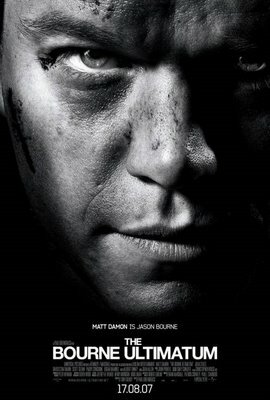 It has Bourne’s weaknesses the flash backs and his humanity which in the end are also his true strength. To that potent mix this film adds one of the most daring slight of hands with the plot of any film I can remember. I see now why it has been mention in the same breath as RashÃ´mon in some reviews I’ve read. It also uses images from the earlier film brilliantly without over doing it. There were a few things that niggled (there always are). Am I really suppose to believe the CIA can pull up the schematics for a Tangiers hotel or cut the phones in that hotel from New York? I also wonder if a CIA black ops team operating so publicly and so blatantly in several European capitals wouldn’t see the American embassies being kicked out of every EU nation or bring down several European governments for permitting such actions. That, I suppose, is the downside to the realism of the series because the repercussions of the plot in the real world would be far wider than those suggested by the film. Putting those few quibbles aside I’d say this was, along with Hot Fuzz, one of the two best films I’ve seen this year.